In light of recent news that Doctor Who Series 10 will be premiering on April 15, and that it’ll be star Peter Capaldi‘s final series, I’ve been reflecting on the Twelfth Doctor’s seemingly all-too-short reign and how much it’s changed even just in the two series we’ve seen. He started out incredibly abrasive and shouty — prone to telling people to shut up — and he’s become one of the most passionately compassionate Doctors of the bunch. Love the way that happens. 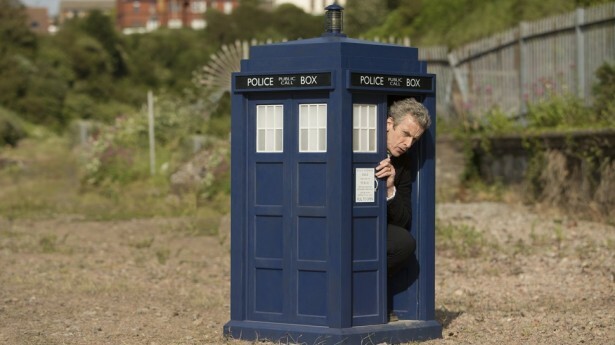 I took a look at Series 8, which I ultimately liked but it took a while. That series, quite different from all of the rest of New Who, dealt with a Doctor and a companion who don’t get along very well, but also desperately need each other. It was a weird co-dependent relationship, and it even led Clara to lie to her boyfriend. She was addicted to Doctorish pursuits. I really appreciated this aspect in retrospect, but it didn’t necessarily make me like the individual episodes any more than I already did. Anyway, to that end (and because I did it for Series 7 lo those many years ago) I’ve decided to rank Series 8 (and later 9). These are my personal choices, of course, and your experience, I’m sure, will vary. This was a series of almost entirely single, standalone episodes, the same as most of Series 7, though I’m going by official story-numbering to denote the one two-parter. Also I’m including the Christmas special “Last Christmas” in this list, because it seems to fit thematically much better with Series 8 than Series 9. There’s no beating around the bush here (pun intended), this episode is dumb. In an incredibly strong back half of a series that has (spoilers) four of my top five stories, right in the middle there was this story, written by Frank Cottrell Boyce. I know the show is sort of for kids, and sometimes the occasional child can make for a great episode, but this series’ fixation on Clara’s students really got on my last nerve. A forest suddenly, overnight, grows to engulf not just London, but the whole world, and one of Clara’s students gets weird visions (“The foughts….the fooooooooughts!”) that tell the Doctor that the plants are protecting the Earth from a solar flare. Ultimately nothing happens, and it would have happened if the Doctor were there or not, which is the hallmark of an episode I say “nope” about. Remember what I was saying about children? Please, by all means, let’s have a whole comedy episode taking place in a school. While there’s definitely some funny stuff in the interactions between Capaldi and Jenna Coleman, my big problem with this episode is the Doctor’s reaction and attitude toward Danny Pink. Why does he hate soldiers all the sudden? And why would he hate someone who isn’t a soldier anymore? It made no sense to me, and it made me actively dislike the Doctor to a degree I wasn’t comfortable with. About halfway through Capaldi’s first episode, he and Clara meet in a restaurant in Victorian London and have one of the funniest and best written scenes of banter Steven Moffat’s ever written. I was dying; it’s so good and well played and each character thinks the other is the one who printed the ad that got them both there. This leads to a great and tense final act with Clara surrounded by clockwork people wanting to steal body parts to rebuild themselves and their ship is amazingly well done. The problem is pretty much everything leading up to that is sooo forced, and Capaldi’s so manic that it doesn’t really work. And Clara’s complete refusal to accept this man as the Doctor seemed painfully out of character. So, start this 75-minute episode at like the 34 minute mark and all is great. This episode looked great, and the basic premise — the moon threatening to crack apart because a creature inside is popping out and whether Earth has the right to kill it — is one with many implications. But the Doctor’s complete abandonment of Clara when she needs his guidance the most is, again, not great. Pretty much, if the Doctor feels especially un-Doctory, I don’t like the episode. This was an episode I was absolutely fine with. Nothing objectionable, except a bit of a sidelining of Clara, and it worked quite well was what was intended — a sci-fi version of Ocean’s Eleven. The only reason it’s not higher is because I forgot about it entirely until I looked at the episode list. This episode gets a lot of needless disdain, and while it doesn’t quite fit in the overall arch of the season, Mark Gatiss’ love letter to the Robin Hood myth proved to be one that I rewatch time and time again. Why? Because it’s so damn funny! I’m a huge fan of needless hostility when there’s no weight behind it, and the scenes of Robin and the Doctor bickering while trapped by the Sheriff of Nottingham never fail to have me howling. The only reason this one isn’t not higher is because we’re getting into some excellent sci-fi territory and that will always take precedent in a sci-fi adventure series. Now I’m no fan of Daleks, in general. I find them boring if used too frequently, and the show does rely on them a lot. But this one was such a weird and cool idea: could you change the thinking of a Dalek from the inside? The result is a cool Fantastic Voyage pastiche, as directed by Ben Wheatley who rocks the proverbial casbah. Still early in Capaldi’s tenure, he’s particularly prickly in this one and even doesn’t care when members of the shrunken crew get murdered by Dalek antibodies, but as far as a treatise on what makes a Dalek tick, it’s a damn fine ep. Every year, there’s what are called “Doctor-Lite Episodes,” or ones where the Doctor’s not in it very much or where they can get all of his scenes done in a day so that he can take a break for a week. Often, these episodes are among the best, because they force the writers to try to shake up the concept a bit, and this one — the second of writer Jamie Mathieson’s back-to-back episodes — gives us a great reason for the Doctor being sidelined: he’s stuck in a slowly-shrinking TARDIS. This makes Clara take the lead, be the Doctor as it were, and it provides us with the beginning of Clara’s eventual downfall. And the notion of a two dimensional alien that devours the dimensionality of other objects is also supremely cool and weird. Christmas specials are hit and miss, but for me, this one hits a whole lot, as it mixed the idea of Santa Claus and his cadre with the notion that what we see might not actually be what’s happening. Despite Nick Frost’s excellent portrayal of St. Nick, the episode is mostly a mixture of Alien, Inception, and kind of weird David Lynch stuff, and it put a capper on the fractured relationship between the Doctor and Clara that had been bubbling through all of Series 8. For a season that wasn’t my fave all around, it ended with a really great pair of episodes — written by Moffat and directed by the excellently great Rachel Talalay — that reintroduced the Master (aka Missy) in excellent style and also gave us one of the darker endings in the show’s history, with Danny Pink dying and becoming an undead Cyberman slave. It also set up the character denouement between the Doctor and Clara that we later saw in “Last Christmas” but did so by having Clara literally threaten to destroy all the TARDIS keys in a volcano. Her actions lead to the Doctor’s lovely “Do you think I care for you so little” line. Man, this finale is killer. By time we got through episode 7 of the series, I thought “Nope, this one’s not really doing it for me,” but then this episode came along — written by Jamie Mathieson, the first of his back-to-backers — and I was back in! On a space train which tries to look like a Victorian Orient Express, a mummy is killing people in a specific span of time, but they’re only visible to the person who’s about to get killed. The Doctor only has that amount of time to learn anything; he doesn’t save them, he just has to learn about the mummy. It’s a great mix of Speed, Agatha Christie, and Hammer Horror. So, once again, this is just my own personal ranking, but I want to hear yours! Let me know in the comments below!